What is it about things being small and going unnoticed? The three French team Deutsch-Bonnet Panhards that ran at the infamous 1955 24 Hours of Le Mans qualify! These small displacement (750cc) racecars become ever more amazing the more one learns about them. The Marques’s namesake comes from the company’s French founders/drivers, Charles Deutsch and Rene Bonnet. Add the engine they fitted to their unique racecar from French auto maker Panhard and you get DB-Panhard. The French say, “Day-Bay”. Based upon the concept that smaller, more streamlined (aerodynamic) and fuel efficient qualities along with being light made for faster speed, the DB’s were enormously successful in their class (H-Sports) and the “Index of Performance” events. The Index of Performance was a handicapped category which rewarded not only speed and endurance, but gas mileage as well. Remember that gas was in short supply in Europe following WWII. When you really think about it, this is a great model for a contemporary sports/racecar maker. With today’s gas prices in flux, import oil issues, Detroit stumbles and a “planet in peril” we need to rethink smaller-lighter-faster. The Mini Cooper S, Mazda’s Speed3 and Honda’s Civic Si are currently ahead of the curve in this thinking. In racing this year, the American Le Mans Series (ALMS) featured a “Green Racing Challenge” event; the “Petit Le Mans” at Road Atlanta in October, 2008. A Penske Racing Porsche won the Prototype class and Corvette Racing won the GT class. Most sporty car buffs know about the infamous 1955 24 Hours of Le Mans because of the deadly accident of Mercedes team driver, Pierre Levegh where approximately 80 spectators lost their lives. A spectacular and horrific crash in front of the stands was captured and recorded on film. This was truly the so-called “Darkest Day” in auto racing. This crash, and rightfully so, overshadowed the accomplishments of the DB-Panhard that year. DB won the 750cc class while finishing 16th overall after 24 hours. This “is” something to be remembered. But, some will be more amazed that a DB traveled the Mulsanne Straight at 117mph, with front wheel drive, a 2 cylinder engine and disc brakes in 1955! Following the 24 Hour race the DB factory team went to Ireland’s Tourist Trophy (TT) and then on to the USA for the 12 Hours of Sebring (FL) in March, 1956. Then the cars were sold to privateer ownership to fund the 1957 DB racing efforts. 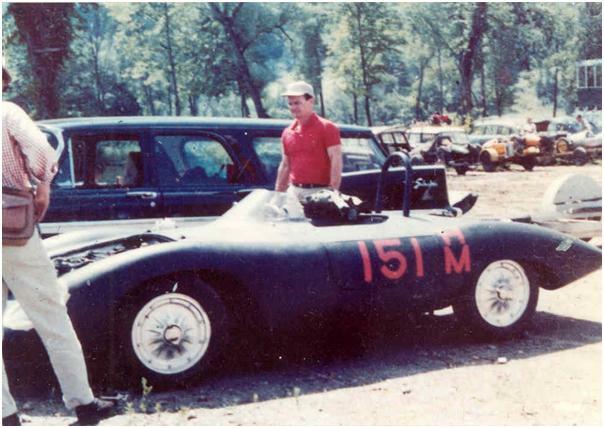 My father, Gordon and his brother Wil raced one of these X-factory team cars from 1957-1960. You can explore these amazing French racecars and their history by following this link: http://mysite.verizon.net/vzeolrbc/db1955. Great story, Greg. I have been curious about these cars, but isn’t a lot of info available. Thanks for providing more reference. If anyone is interested, check out our website: http://www.panhardusa.org. We are the American club for Panhards and DB cars. We have about 60 members who have over 150 cars in the USA, Mexico, and Canada. It’s very exciting to hear about a very special car like Greg’s. We also have some videos of driving our cars posted on YouTube. Does anyone know the history of the DB that Bill Devin took a body mold off of? It was raced at Sebring. I used to own the car. It had been shunted and sported a Devin fiberglass front end that tilted forward.I sold it about 1977,in Oakland, CA. Not sure if its the same car, but we have seen a Devin Panhard vintage raced. I believe it’s in Houston. I can recall he and i taking our cars to i believe it was Montgomery md. There is an Irishman called Jim O’Riordan who worked as a mechanic with Rene Bonnet on his racing team. Jim was an Olympic team member for Ireland in the 1950’s and got an athletic scholarship in a U.S. university. He joined the Army and served in Vietnam. He is currently in a Nursing Home in Dublin.